Vertu, a company best known for making $10,000 Android phones (running software from 2014) and $190 USB cables, is somehow still in business. And even more astoundingly, someone is still interested in what it has to offer. According to the Daily Telegraph, the company that makes wildly overpriced phones for rich assholes was recently sold to Baferton Ltd., an investment firm owned Hakan Uzan, the son of what was once one of Turkey’s wealthiest and most powerful families, for $61 million. As the Verge notes, Baferton is Vertu’s third owner since Nokia spun the company off back in 2012. Vertu’s value has fallen since then—it was sold for $250 million a Swedish investment firm in 2012 and then offloaded to a Chinese investor, Godin Holding, in late 2015. It doesn’t look like Godin Holdings ever did anything with Vertu, however—the Telegraph notes that it never filed its required financial data with the UK government, making it difficult to ascertain how many much money it made, how much money it lost, or its tax rate. Moreover, according to Vertu’s website, the company hasn’t released a new phone since 2015. The phones, which were midrange at best back in 2015, are absolutely antiquated now. But man, that hand-assembled craftsmanship for overpriced leather materials has to be worth something right? Right? Nope. Don’t get me wrong—I understand that there are people dumb enough to spend $50,000 on a smartphone, just because they can. I just question whether there are enough people to make this sort of business viable. Fifty thousand dollars for a smartphone is bad enough. Why go and spend million of dollars to acquire something so absurd? Vertu has been around since 1998, when it was then a division of Nokia. That means it has been selling overpriced trinkets to idiots for almost 20 years. I can sort of understand how Vertu was able to carve out a niche back in those pre-smartphone days; after all, phones didn’t have to evolve much. A Symbian-based phone made with some super premium materials could potentially appeal to a super-rich oligarch, because the phone itself worked the same as any other dumbphone. But in 2017, I can’t imagine even the very wealthy splurging on a phone that would struggle to even open up Instagram or Facebook. Basic accounting shows that these instincts are probably correct. Back in 2014—the last time Vertu filed its taxes—the company reportedly lost $64 million on sales of $134 million. Granted, I’m still shocked at that revenue figure, but those losses prove that even with these high prices, the markup isn’t what it should be. It’s not exactly clear what Baferton thinks it will get from Vertu, either. 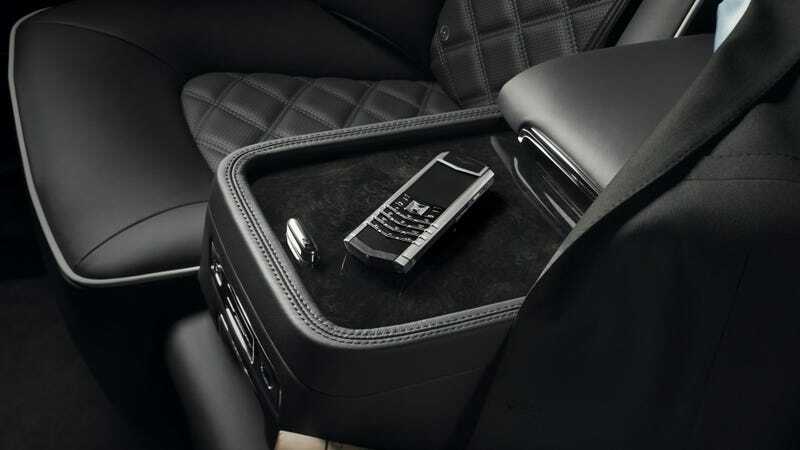 In a statement, a spokesman for Hakan Uzan said, “Vertu is a powerful brand with an acknowledged market niche.” Gordan Watson, Vertu’s CEO, had an equally meaningless take. “Baferton shares our vision: 1.5 billion smartphones are sold each year and there is demand for a high-quality, exclusive product with associated services,” he told the Telegraph. Frankly, this seems like a a bad business decision made by a guy from a family with a bad history of business decisions. If I’m trying to make a good business investment (especially in the shadow of my family’s exile and massive corruption scandal), buying a brand with depreciating assets and a genuinely terrible product makes no sense. I get that Vertu has a 3,800 square foot store on Madison Avenue, but that doesn’t mean it has any customers worth whatever that real estate must cost. Even BlackBerry eventually realized that overpriced luxury phones are a dying market. Even the dumbest of rich people today realize it makes a lot more sense to buy a $5,500 Louis Vuitton iPhone 7 Plus case than it does to buy a slow, ugly, smartphone.